A new set of kitchen countertops can make a world of difference for increasing your home’s aesthetic and resale value, especially when you upgrade from laminate to stone. While durable and completely functional, synthetic materials tend to not offer nearly as many benefits as high quality granite, quartz, and marble. There’s a growing selection of countertop products, but stone will forever remain one of the top contenders. Many homeowners are apt to choose granite, and for all good reasons of course. This treasured classic has been around for many years, comes in a wide array of gorgeous color palettes, and is virtually impervious to heat, chipping, and staining. Needless to say, you can never go wrong by investing in granite countertops, but you should consider keeping the options open! Quartz and marble are equally stunning from a visual perspective, and are just as reliable for long-term use. While they do tend to cost a bit more than competing countertop materials, granite and quartz are the unsung heroes of the durability factor! Both are naturally resistant to high temperatures, chemicals, scratches, and stains, which is pretty much everything that goes on in the average kitchen. They’re also very low-maintenance. Once installed, you need only wipe them on a regular basis. 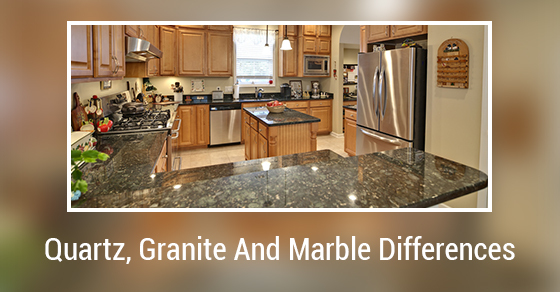 The key difference between these two materials is that granite is all-natural and quartz surface are synthetically engineered from natural stone. Quartz is typically pricier per slab, but unlike granite, does not need to be sealed each year. This process prevents the stone’s porous composition from absorbing water, which can lead to discoloration. Marble is widely regarded for its naturally veined appearance, as well as for its tendency to age much better than granite or quartz. Strong, beautiful, and available in many color striations, marble is the perfect choice for anyone looking to upgrade their kitchen or bathroom countertops to an elegant, timeless product! The only downside is that, like granite, marble is porous and thus susceptible to absorption. You should never let spills sit idle on these surfaces, especially chemical agents that have high base or acidic levels. They can suffer from etching if so. In sum, there is really no wrong choice between quartz, granite, and marble. It all comes down to personal preference!